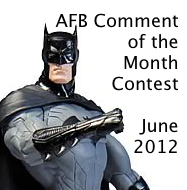 The AFB Comment of the Month Contest for June 2012! ​First off, thanks to everyone who commented on last month’s blog posts! Congratulations to "TotalToyz" for being our randomly selected winner! 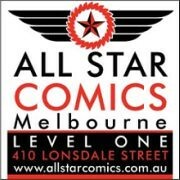 Once we hear from TT, (you can can PM your choice to "Scotty" at the AFB Forum or email me at scott@actionfigureblues.com), his choice of either the Arkham City Wave 2 Catwoman figure from DC Direct or the Marvel Legends Wave 2 Unmasked Dark Wolverine from Hasbro will be on the way when available from Mike’s Comics N’ Stuff. Now to June's Contest: on offer is the New 52 Batman Action Figure from DC Collectibles - which will be a great prize! you will be given a choice of one of the two figures on offer from the month’s contest – figures will be in their original packaging. figures will be sent by first class mail within the US (Mike is sending them, remember) and first class international to any overseas winner. An overseas winner can elect to chip in for Priority Mail or Insurance, but otherwise we can’t take any responsibility for a parcel that doesn’t arrive – after all this is coming out of AFB’s not dreadfully deep pockets! Once again, thanks to Mike for making this all possible for us, and here’s to another happy month of commenting! Until next time!